Family, friends and hundreds of colleagues have said farewell to a suburban New York firefighter killed in a suspicious blaze. Archbishop Timothy Dolan was the principal celebrant of Tuesday's funeral Mass for Yonkers Firefighter Patrick Joyce. Gov. David Paterson and several other politicians attended. 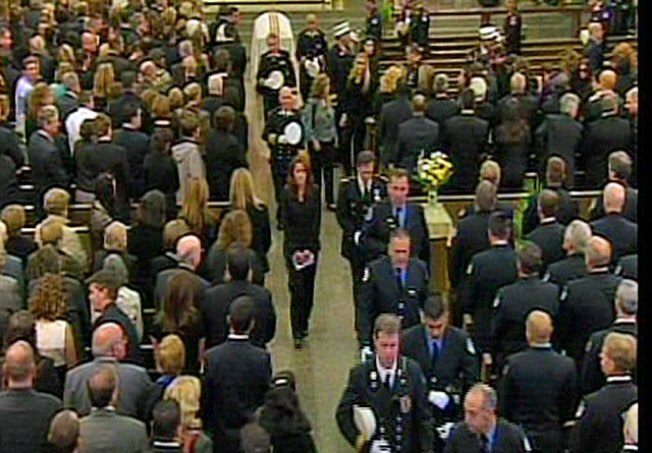 Joyce's coffin arrived at St. Margaret of Cortona Church in the Bronx atop a fire engine. Firefighters from throughout the metropolitan area massed in uniform outside. During the service, Joyce's wife, Tara, said he was "the most beautiful person the world has ever known." Their two young daughters sat at the front of the church. Joyce was killed during a house fire Friday. An evicted tenant who allegedly set the fire has been charged with murder.